M/Y Magnifica accommodates up to 10 guests in five staterooms. These include a full width master cabin on the main deck, two large identically sized VIP cabins with king beds, and two twin cabins. All cabins have en-suite facilities. Magnifica’s innovative external lines strongly define her unique character. She was built by CRN yachts which are an undisputed symbol of luxury and prestige. Their unmistakable "family feeling" has long fascinated the international community and many royal families. Magnifica offers exceptional volume for a 43m yacht. She is spacious, stylish and modern and incorporates advanced technology which is certainly a distinctive characteristic of this yacht. Following the desires expressed by the owner, “Magnifica” is innovative for the complexity of its computer and entertainment systems. One highlight includes the media package featuring the huge projection screens on the top deck, sky lounge and master cabin plus video conferencing, email, fax, GSM and satellite telephones. The yacht’s salon is light and airy and the immense deck space is ideal for entertaining. 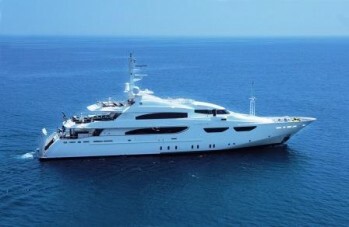 She is available for select charters in the Caribbean and Mediterranean oceans. Her media package features the huge projection screens on the top deck, sky lounge and master cabin plus video conferencing, fax, email, GSM and satellite phones. Her salon is light and airy and the immense deck space is ideal for entertaining, Spa Pool on the sun deck and toys to include wave runners. She has dive gear and a Smart car, 1 Nautica Deluxe 18ft R.I.B. tender (with Honda 90 4 stroke engine) as certified for 12 passengers. Akerboom concealed in the aft bulwark of the sun deck Diving compressor - Bauer dive compressor and bottle/breathing apparatus.